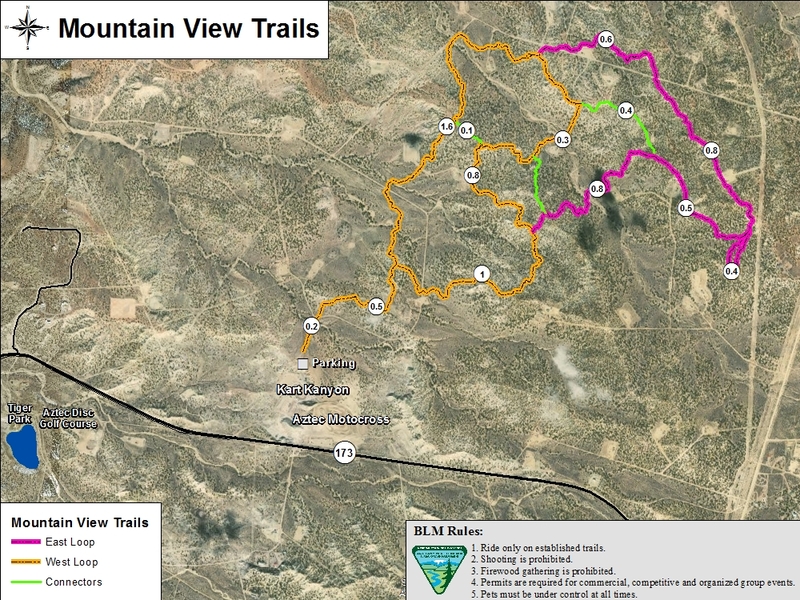 A local favorite, Mountain View Trails is a great high desert singletrack located north of Aztec Kart Kanyon go-cart track. The trail is hard packed with simple climbs and short fast flow descents. A little tough for beginners starting out but for most average riders a great fun ride. The trail provides excellent views of the San Juan Mountains and if looking west you will see Shiprock. The trail for the most part can be ridden all year round. Come out and glide on your mountain bike through the fresh air scent of Juniper trees and Sage brush lined trail. Parking is available either at Tiger Park or south of Kart Kanyon, off of Hwy 173 (Navajo Dam Road).